AirplaneGeeks 370 NASA Aviation Safety Reporting System - Airplane Geeks Podcast - The weekly audio podcast that explores and expands your passion for aviation. The NASA Aviation Safety Reporting System, the European Aviation Safety Agency takes issue with pilot license renewal practices in Germany, medical requirements under the Pilot’s Bill of Rights, ICAO creates a site for aircraft tracking, the consequences for air traffic controllers who make mistakes, and the first woman cleared to fly the F-35A Lightning II. Guest Linda Connell is Director of the NASA Aviation Safety Reporting System and a Research Psychologist for NASA Ames Research Center. The ASRS collects and acts on voluntarily submitted aviation safety incident/situation reports from pilots, controllers, and others. 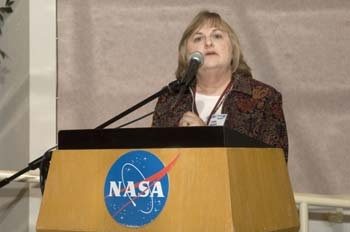 Linda has been working at NASA Ames Research Center since 1981, and has participated in a number of studies with domestic and international research teams exploring human factor issues in aviation environments. A Registered Nurse and member of the Aircraft Owners and Pilots Association, Linda continues to evaluate proactive aviation safety information on a variety of topics, including pilot/controller voice communication, emergency medical helicopter operations, aviation maintenance, cabin safety, and technology applications in aviation environments. We talk with Linda about the formation of the ASRS, the process to collect safety data in a way that guarantees immunity, the analysis of the data and how subcontractors are utilized, and the 10 day window. We also discuss the alerts process and how to submit reports. The European Aviation Safety Agency says license renewal practices for pilots in Germany favor privacy over safety. Noting that Germany has addressed some of the concerns, the EU says others remain. If Germany does not comply with the Commission’s demands, it could be taken to court. An online aeromedical course every two years. Logbook entries that certify the pilot has seen their personal doctors at least once every four years (and received any needed treatment for medical conditions). 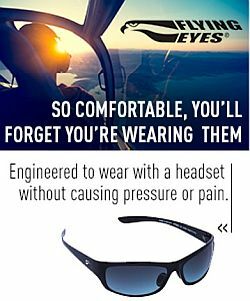 A one-time medical for new pilots and pilots who haven’t had a medical in the last 10 years. The International Civil Aviation Organization (ICAO) has created a Global Tracking Initiatives web page to serve as “a repository of documents related to aircraft tracking.” The page presents a timeline of events and documents. Adoption of a 15-minute aircraft tracking Standard is expected at the end of 2015. The New York-based private aviation membership company Wheels Up has an order for 105 Beechcraft King Air 350i’s, and has raised $115 million in capital for business expansion. Boeing flew the KC-46A Paine Field in Everett, Washington for a four hour first flight. The KC-46A is based on the Boeing 767 commercial airliner. 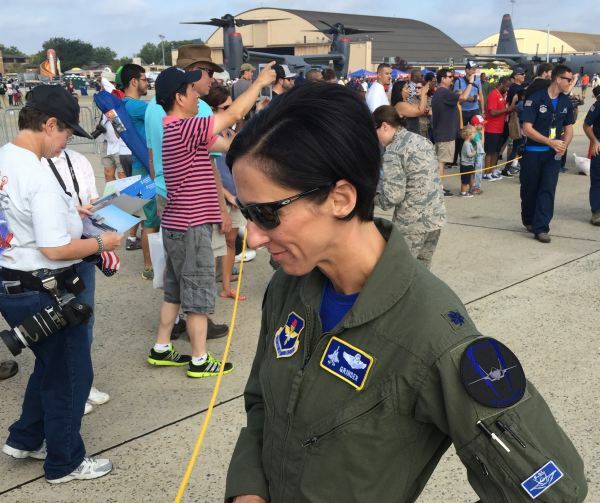 David attended the Joint Base Andrews’ open house on September 19th 2015, where he interviewed Lieutenant Colonel Christine “Grinder” Mau, Deputy Commander for the Operations Group of the 33rd Fighter Wing. Col. Mau was the first woman cleared to fly the F-35A Lightning II, and one of only 52 women fighter pilots in the USAF. She talks about what it’s like to fly the F-35A, and believing in your dreams. Micah gives us some thoughts on the late Alan Purwin. Brian talks with listener Hendrik in Hamburg, Germany. The Good Traveler Blog and The Art of The Good Traveler. 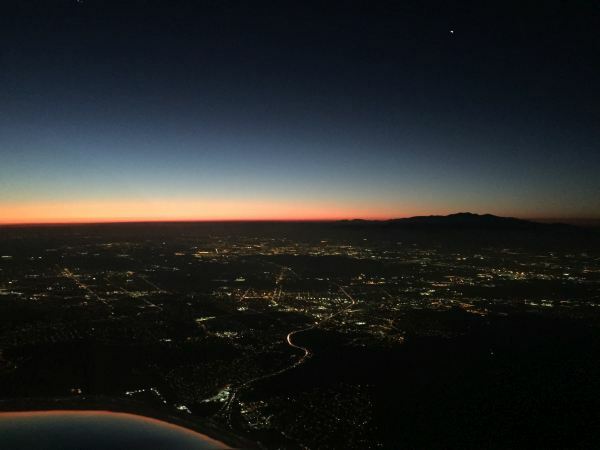 Michael sends this photo from his Cirrus SR22T looking over Los Angeles on airway V186 from the Paradise VOR to Van Nuys VOR, September 17, 2015. The light in the top right of the picture is a 777 going into LAX. 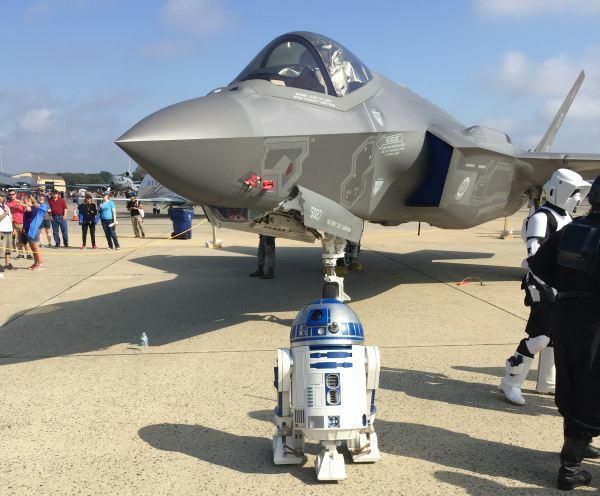 This entry was posted in Episodes and tagged ASRS, ATC, F-35, ICAO, KC-46, NASA, Pilot's Bill of Rights, safety, Wheels Up on September 30, 2015 by maxflight.